Here I am to take shots at the co-commissioner. Andrew who I know to be extremely shrewd, but I cannot help but wonder if Bailey got too cute during this draft. The pitchers are sweet. The hitters look great and I had similar aspirations going after a pair of no doubt sluggers, but there is likely just a few too many holes on this roster. The line up is clearly stars and scrubs. Miguel Cabrera and Joey Votto are going to make sure each and every week your hitters are competitive. The catcher position is already punted, which can be okay. Jhonny Peralta could be the steal of the draft, but he’s not starting until summer. You can see the framework’s existence. Knowing this team left money on the table, on top of trading cash away to buy Blake Snell, there’s just a lot of work to be done here. The world is already low on guys like Corey Dickerson, Trevor Plouffe and Denard Span for reasonable reasons. This line up is a Cabrera or Votto season ending injury from being in uh-oh territory. Carlos Carrasco, Johnny Cueto, Tyson Ross and Sonny Gray are all tier one starting pitchers. Or at the very least capable of pitching as tier ones. But the pitching staff as a whole is not great for two reasons. First the bullpen is already short a player with nothing splashy. Second, Patrick Corbin is a great fifth, but Chase Anderson, Mat Latos and Nick Tropeano all are cheap attempts at being clever. Capital City may never need any of them, and Bailey would clearly prefer it that way. While it’s not great because CCI’s pitching depth is lackluster, the guys on the bench for hitters do play multiple positions. The roster flexibility will allow CCI to fill line up slots regularly on a daily basis. Those extra plate appearances will add up and will make the difference in a weekly match-up at least once this season. 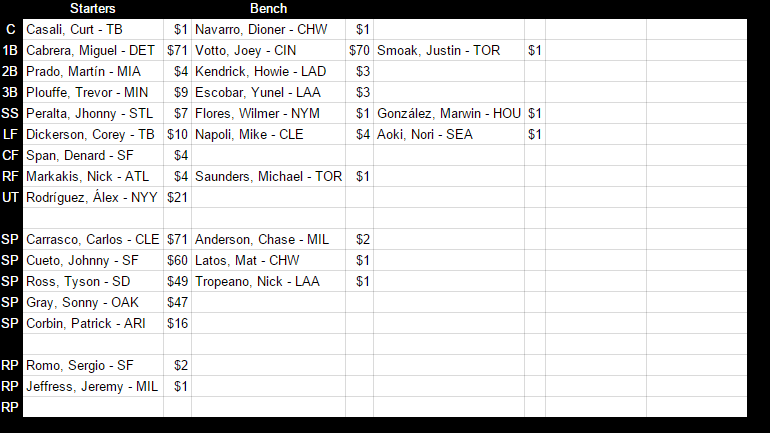 It is hard to bet on all the pitchers taking the year off. So in this case 2016 is bad if Miggy and Votto both finish outside the top 10 for first basemen. I love Alex Rodriguez as much as the next guy, but if you took the $21 spent on him and padded it with the cash left on the table you have basically any tier 1-2 hitter available. Whoops. The two hitters and the four pitchers carry this roster into the playoffs and just run through everyone. With any amount of luck, between the top four, he’s going to get 1 maybe 2 with 2-starts each week. That means six starts between top tier starters each week. Filling it in with Corbin or Chase Anderson is alright at that point. The hitters are good enough to hold a regular baseline.